Ever since the trailer release of Padmavati, the film has been getting bombardment of criticisms from all across the nation. From rallies of protests to furious tweets, the fake history-lovers have taken a toll on such lavishly-crafted film, much much before the release. What until today, was a fierce protest, in literal sense, apparently doesn’t look like a protest. Yes, it seems Rajasthan is ready to script a new history of protesting against the film, which they allege, would feature a distorted history of Rani Padmini. For god sake, tell me what under the sky is more awful than murdering a man in the garb of protest? I know its too ghastly a news-capsule for today, but unfortunately, a man was found dead in Nahargarh Fort in Jaipur. Beside on the stones near the fort’s adjacent wall, was a shamelessly squiggled death note that read “Hum sirf putle nahin latkate hain ” (It’s not just effigies that we hang — Padmavati). Murder or suicide? The case still pendulates between both, and the concerned police department is yet to take its course of action to investigate that. Be it any, but why would a protest against the film, which even the censor board is yet to adjudge, take such a deadly turn? The insanity of this fringe group from Rajasthan – Karni Sena- has in fact touched a new height. This group is reported to have threatened Bhansali and Padukone. Whether or not, this 190-crore film will take its space on silver-screen – God knows! But, seeing priceless lives ending, in this, is the most horrendous way of expressing love for History. Where, as a nation, are we heading towards? What All Details Does Your PAN Card Reveal About You? Permanent Account Number (PAN) card is like an identity card for Indian nationals, with a set of alpha-numeric digits imprinted on it. But tell me honestly, if you ever cared to decode the sequence of characters on it. In fact, did you even know that each of the letters carries a meaning, and is not chosen randomly? Anyway, you know, it’s never late than never learnt. Next time you carry the card in your wallet, be sure to feel proud. Because, you’ll be knowing what you’re carrying, in literal sense. Hey! You’re just a minute away before you go boasting around ‘Arre, PAN card sirf dikhane ke liye nai hai, samajhne ke liye bhi hai’. First three letters can be a permutation and combination of anything from AAA to ZZZ. Next four numbers can be any combination from 0001to 9999. Last digit is simply a check digit. Done. Done. Done. Pat on your back as a token of appreciation for self. You finally know what you’ve been carrying around since years. As the name goes, chicken here is genuinely delectable to your taste-buds. Booze coupled with fine dine to serve both your hunger and liquor-thirst. Limitless choices on the menu – be it from vegetarian to non-vegetarian food, or coolers to spirits. What a happening place! This is not me saying, but any first-timer who have been to this place. And once upon a time, I was too a first-timer.  Good food. Good ambience. Good drinks. Goods when united, is the best. Get all your stress drained out together into the pan, every time you pee the cocktail out!  Stress-buster this place is. No doubt! Triple your fun quotient here, with amazing ambiance, delightful food and perfect drink-menu. Rooftop seating. Period. There’s no beautiful phrase to pen down the beauty of open roof and the undulating views around. You simply need to be here to capture the look and feel of this place. And of course, the liquids – to amplify the happy mood more. Ultimate place to party! Dance floor here can awaken the maddening dancer within you. Alcohol to fuel it more! And yes, don’t forget to savour the delicious tastes on the menu card. G-198-199, Haware Fantasia Business Park, Opposite VashiRailway Station, Sector 30A, Vashi, Navi Mumbai. Verdict: Any place is better with right company and favourite drinks, but these Navi Mumbai bars are definitely notch better than the best. Looking For Thali Restaurants In Navi Mumbai? If by any chance, you love picking and eliminating random things reciting the small, old ‘Inky Pinky Ponky’ limerick, you won’t anymore. Oh yeah, I’m talking about these scrumptious thali restaurants of Navi Mumbai, where foodstuffs on the plate are too many to run your eyes over, at just one go. Scene 2: You prod backward the thali, close at your hand. Reputed food chain in the culinary setting of Mumbai, this outlet is not too gaudy with its décor, but too good with its food. Minimal interiors with maximum taste! 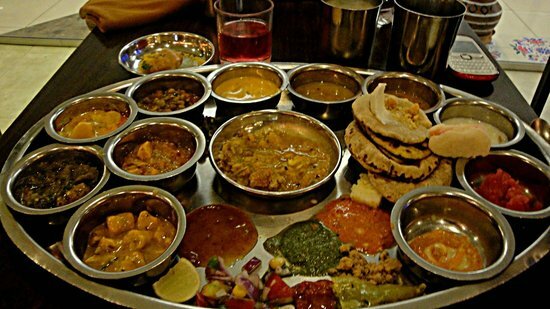 Infuse yourself in Rajasthani culture, right here in Navi Mumbai, at Rajdhani Thali Restaurant. From the ethnic charms of working staff, to Rajasthani touch in their flavour, this place is must-visit for thali lovers. With homely feel and welcoming staffs, the delicacies of thali here, will simply make a smooth and prompt way to your stomach, leaving you full, yet unrepressed. The recent ghastly murder of seven-year-old Pradyuman Thakur at Gurgaon’s Ryan international School has thrown the entire country into an unthinkable outrage. And why not? After all, on a school premise – meant to construct the future of a child – an innocent future breathed its last. For forever. Taking the matter into a much-needed consideration, Navi Mumbai Police decided to go heedful about it immediately. They have advised all the schools across the city to issue Radio Frequency Identification Cards (RFIDS), by the virtue of which, child-safety is bound to ensue. What are these Radio Frequency Identification Cards (RFIDS), which Navi Mumbai Police wants all the city schools to introduce? These are the cards implanted with smart chips, which are designed to keep a track of students commuting by school bus. It would keep a record of as and when students boarded and alighted from the bus. Accordingly, an SMS would automatically be dropped on the registered mobile of their respective parents. Laudably, the city police have come up with a fabulous safety-plan for students. As of now, Navi Mumbai police has rolled out a full-proof list of safety measures to all schools, however schools except Delhi public school are yet to implement this facility. Succulent and delicious to nibble at, have you ever pondered on how these creepy-looking crabs are farmed? But prior to shooting your eyeballs on the video below, know what mud crab farming is about. By the way, it is in the interest of you crab-buffs only that ups the demand of it in the market. Why not watch out the process that goes behind your satiating meal? So, what exactly happens in this popularly practised crab farming? Crabs naturally trapped from water bodies are not of marketable size, and are hence nurtured to make it grow out and become market-viable. About 4mm wide crabs are cultivated to become of size as big as 10 cm in width, in a span of a year. Now, watch out the labour that goes in Gunabai Crab Farm in Vashi, Navi Mumbai. Ask Kolkatans what Durga Puja (nay, Pujo) means to them, and you’ll understand why and how Puja is so much more than a festival in Kolkata. You’ll know how it is an emotion they ecstatically wait for, throughout the year. Just ask them, but prior to that, do muster up enough patience to watch them blabbing endlessly about their attachment with ‘Pujo’. That special is the essence of Durga Puja for them. Anyway, the ditto Pujo-flamboyance of Kolkata can’t be replicated in Navi Mumbai. But, Navi Mumbai does deck itself up with beautiful pandals in its nooks and corners. Lively enough to stir up the Pujo-Pujo feel, over and around in the air. So, this puja, don’t go cribbing around ‘Aww, I miss Durga Puja so much’. Instead, go and be a part of these classy associations. Established in 2005 at Vashi, Vashi Cultural Association (VCA) is one of the most-enjoyed club during Durga Puja in Navi Mumbai. Keeping up with the energies of Bengali culture, VCA hosts 5-day program pertaining to traditional culture and art of Bengalis, every year. VCA has also been endeavouring seamlessly to build up a better society, through its small but meaningful initiatives. Somewhere in the heart of the town of Kharghar, every Bengali has their heart set on the prettified lanes of Utsav Chowk in Kharghar, during the merrier days of Durga Puja. With the puja of Bengal Cultural Association Kharghar, Bengalis in Kharghar are certainly poised to live the grandeur of Kolkata in Mumbai. With its premise at sector 6, Vashi, Navi Mumbai Bengali Association (NMBA) is one of the largest association of Bengalis in Maharashtra. Ever since its commemoration in 1981, it has been preserving the aura of pujo in the fabric of multi-ethnic Navi Mumbai since decades. All these associations arouse bang-on bong feel within the Bengalis away from their roots- Bengal, but, yet closer.